As the whisky industry grows in Australia, it's always great receiving press releases from distilleries like Hellyers Road in Tasmania and sharing their good news. Below is an announcement about Hellyers Road Distilleries being award the Small Business award and the higher award of Tasmania's overall champion export business. Last year we were delighted to be announced as Tasmania's Small Business Exporter of the Year for the first time. On Friday evening in Hobart we went back to back, again winning the Small Business award but to cap off a wonderful outcome for Hellyers Road Distillery, we were also announced as Tasmania's overall champion export business! 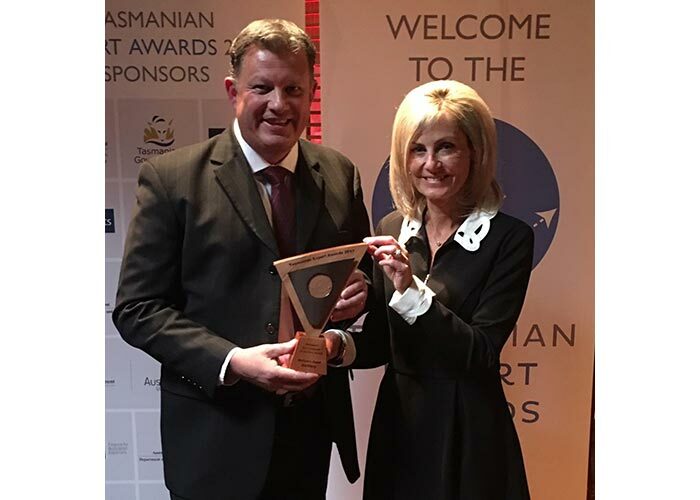 It was a tremendous honour to be recognised as the best export business in Tasmania and master distiller, Mark Littler, along with Chairman, Neville Latimer, was there to accept the awards, the major award being presented by State Government minister, Elise Archer, pictured above with Mark. "We were hopeful of being succesful in the Small Business category again this year but to be presented with the award as Tasmania's foremost export business was quite overwhelming", Mark said. "When one thinks of the many hard-working and successful businesses that operate in Tasmania and compete on the world stage, this award is truly a great honour. While our whisky distilillery is the largest operation in Australia it is still a relative minnow in a massive global industry". Nonetheless, our brand is now becoming very well recognised in Europe and as a result sales are growing. We have gone from sending one pallet of whisky to Europe each year to sending two container loads in the past 12 months. Our wonderfully supportive European distributors, La Maison du Whisky have recently indicated to us that they expect their annual order to be four to five containers within the next few years. We have a lot of whisky to make between now and then!" Mark Littler was glowing in his praise of the people who have helped drive the distillery's export success. "Internally we have a great team who works very hard and receives the full backing of an enthusiastic board and company shareholders. On the outside, we have been able to align the business with some highly skilled distribution partners such as La Maison du Whisky and their affiliates, Symposion in Sweden, Ferrand Deutschland in Germany, Ultra-Premium Brands of the Czech Republic, Vault Fine Spirits-India and Serdis Centre De Gros in New Caledonia. In Japan we enjoy a wonderful relationship with Toa Shoji Ltd. Of course, we should not understate the selling power of our quality single malt whiskies which has been a strong determinant in our growth and recent global success", he concluded.